An Aztec conquest released the secrets of vanilla into the world–and the world embraced the distinctive attributes of this new wonder. We took our queue from the European chocolate invasion and created a French Vanilla truffle known for its rich, fragrant flavor. 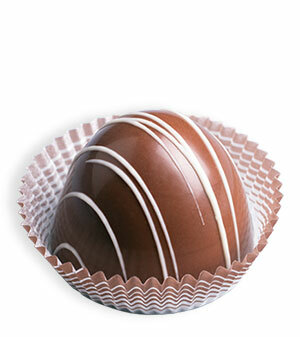 White chocolate ganache, sweet and creamy undertones of vanilla tucked into a milk chocolate shell. Which vanilla do we use? Vanilla from Madagascar, Indonesia, Mexico, or Tahiti? Our vanilla is a unique blend that marries floral, fruit and woody accents to compliment our chocolates. Very seductive!